• 2 - 4" diameter lights with 26' lead wire & 4 pole flat connector. • May be mounted horizontally or vertically. • Magnetic bases swivel on any angle. • Handy tough plastic tote box included. 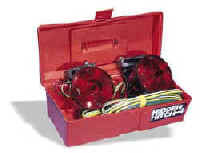 • 2 - 4" diameter lights with 26' lead wire with 4 pole flat connector. 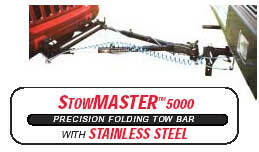 • Conveniently mounts to trunk lid. • Allows motorhome to power lights on towed vehicle without power feedback. 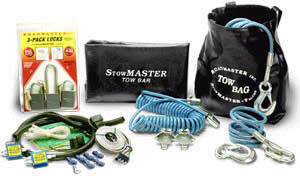 • Used with motorhomes towing imports or vehicles that use a 3 wire system.